Enter one CSS class per line. 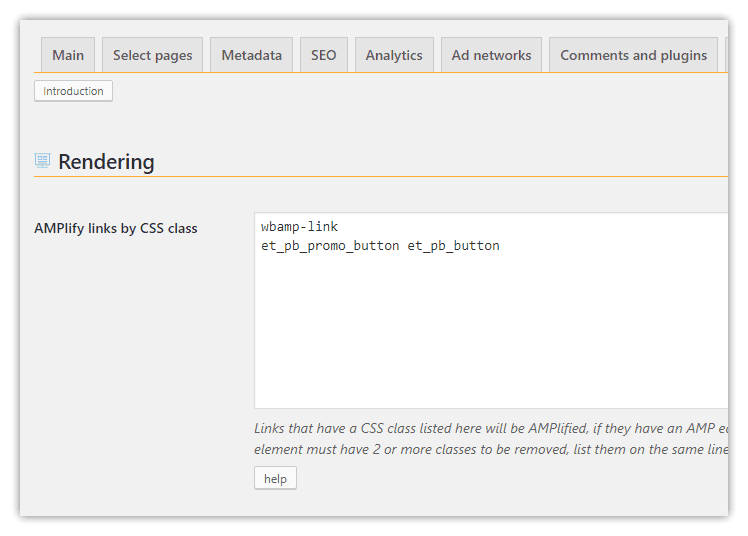 If you need to only AMPlify links that have more than one class, enter all classes on the same line. On the example above, links with both the et_pb_promo_button and et_pb_button will be AMPlified, while any link that has only the et_pb_promo_button OR et_pb_button will not. If enabled, weeblrAMP custom embed codes in your content will be turned into their AMP equivalent. Embed codes look like [wbamp type="twitter" tweetid="123456789" cards="hidden"]. If disabled, those codes will still be removed from content. will be turned into the equivalent Tweet widget. Links handled are from: Twitter, Instagram, Vine, YouTube, DailyMotion and Facebook. As mentioned on the Updating page, this is where you will enter your acccess key, to allow weeblrAMP updates for this site. Please refer to the Updating page for more details, ie: where to find that key, and how to register your site address for updates. An access key is not needed with the Community edition of weeblrAMP, and this field is disabled on it. The suffix to use to recognize AMP pages. Defaul to amp. Not used if in Standalone mode, where all pages are AMPlified anyway. You should only change this suffix if you have a very good reason. For instance if "amp" was already used on your site URLs, and creates a conflict of some sort. This should be extremely rare. Those buttons are pre-filled with the current page URL, so just pressing on either of them will take you directly to the validation results. Pretty handy when checking your pages validity, which we absolutely recommend. The module is never displayed on localhost or 127.0.0.1, as validators need access to the pages tested. A random token that will be required to access your AMP pages when in Development mode. This is used to prevent general access, but let Google validators read the pages to test them. Empty the field to disable that feature. You can access the AMP version of a page by appending /amp/?amptoken=YOUR_DEBUG_TOKEN to the page regular URL. 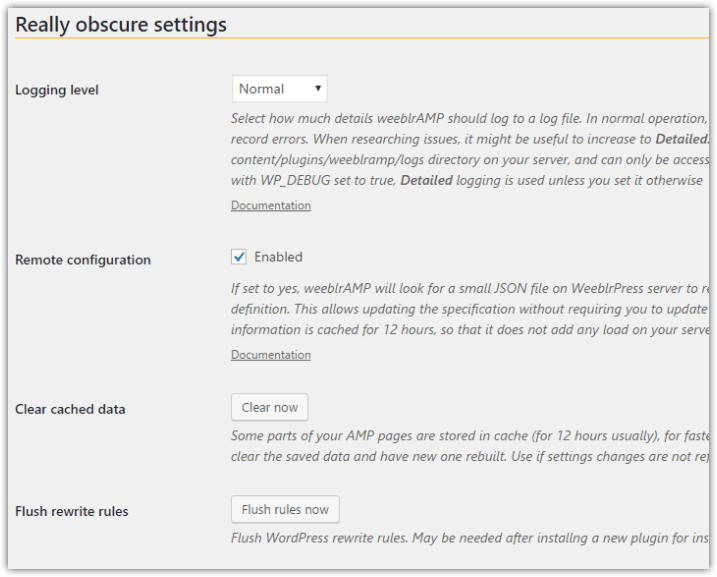 If set to, weeblrAMP can record in a log file on your server some basic, or more detailed information about your AMP pages creation and display process. Set to Detailed and look at the files to look for informations. We might ask you these files during a support request. As the AMP specification evolves rapidly, weeblrAMP is equipped with the ability to read the AMP specification from a small public file hosted by us. Should the AMP spec change, in many cases we will be able to simply update that single file and make your AMP pages good again, without requiring you to update the plugin. NB: the remote file read is only happening once every 12 hours, to avoid slowing down your site in any way. This feature is only supported in the regular edition of weeblrAMP. To allow WordPress to recognize AMP pages, with their amp suffix, weeblrAMP has to do quite a few things under the hood, especially for Custom post Types, and pagination. When you install a new plugin on your site, or in case of a major update of an existing plugin that changes its internal details, you may have to click that button and "flush the rewrite rules", so that those rules are updated with the details of the new plugins.